The Associate of Applied Science degree in Aerospace Technology offers a concentration in Structures and Assembly or Welding. It prepares graduates for employment in the aerospace and related industries through classroom and hands-on laboratory instruction in propulsion structures and assembly or specialized welding. 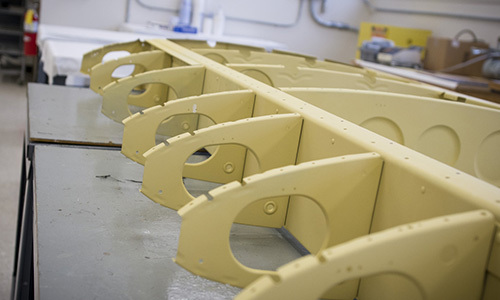 In the Structures and Assembly program, students learn mechanical and electrical assembly which includes composites manufacturing, various testing methods; coating methods, including to include application of paint and primers; and bonding methods used in the assembly processes. Training in these manufacturing processes enables students to work on flight hardware in rockets, missiles, planes, helicopters and other aerospace or military hardware. Some of the classes include independent certifications provided to assist in employment opportunities. Aerospace welding students learn theory and hands-on skills. Beginning with basic welding (gas and arc), orbital tube welding, plasma arc, brazing, and cutting processes used in manufacturing. Advanced classes teach students how to produce acceptable welds with gas tungsten arc welding (GTAW) and plasma arc welding (PAW) equipment. The last class in the program prepares students for welding operator certification in the aerospace industry. SpaceTEC® administers internationally accredited technical certifications for aerospace technicians. Its certification programs offer performance-based examinations that result in industry-driven nationally recognized credentials which reflect the competencies employers demand. The certification program is offered through a nation-wide consortium of community and technical colleges, universities, business and industry organizations, and government agencies. Calhoun Community College is a member institution. SpaceTEC® Certified Aerospace Technician® is the only FAA-recognized, national, performance-based credential specifically tailored for the nation’s Commercial Space industry. SpaceTEC® certifications are accredited to ISO 17024 requirements by the International Certification Accreditation Council (ICAC). Aerospace technicians are employed as assemblers, operators, engineering technicians, test technicians, aerospace welders, etc. Calhoun’s aerospace program includes co-op opportunities with local aerospace industry partners which helps students and industry to work and learn together. The typical base salary ranges for entry level to experienced technicians is $38,000 – $76,000. The base salary ranges do not include overtime or benefits.